In-Depth FREE Destructor Tutorial, and more! 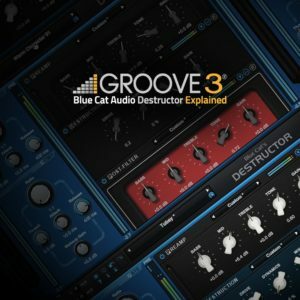 Our partners at Groove3 have released an awesome in-depth tutorial for Blue Cat’s Destructor: all features of the plug-in are covered, from the straightforward easy-mode to the most advanced side chain distortion capabilities. This tutorial is definitely recommended if you want to discover the plug-in or get the best out of it! And you know what? This tutorial is entirely FREE: if you are not already a Groove3 customer, register on this page within two weeks, you get a free 30-days pass to watch not only this tutorial, but all others, including the PatchWork and MB-7 Mixer trainings! This entry was posted in Partners, Tip of the Day / Tutorials, Videos and tagged Destructor by bluecat. Bookmark the permalink.